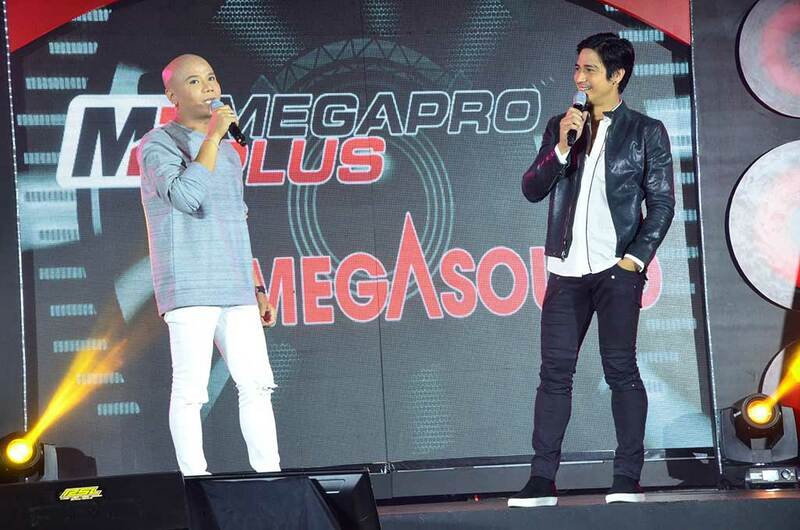 Ending all the anticipation on who will be the two new names that will take the karaoke marquee to new heights, MegaproPlus Megasound introduced Piolo Pascual – one of the biggest personalities in Philippine show business today who made headway as an actor, TV host, filmmaker and singer. Among Piolo's most notable work in the industry includes Milan, Dekada ’70, Starting Over Again, The Breakup Playlist, and Last Night. He's also known to star in various soap operas on TV like Esperanza, Lovers in Paris and the recent one, Since I Found You, as well as being a mainstay in Home Sweetie Home and a longtime host of ABS-CBN's weekly show A.S.A.P. Greeting fans with a renewed sense of excitement for the future, MegaproPlus Megasound also introduced Wacky Kiray – a popular stand-up comedian, host, actor and singer who became renowned in the celebrity talent competition I Can Do That, before earning his spot in the spotlight from the hit reality game show, I Can See Your Voice, not to mention being a mainstay of other shows like Bagani, Banana Sundae and Home Sweetie Home. Primed as The Mega Launch: Ambassador's Night, it was indeed a huge gathering of the trade partners, investors and media - all of which were amused and entertained when Piolo Pascual and Wacky Kiray graced the stage by serenading them with MegaproPlus Megasound's newly-arranged jingle, matched with their very own music video. MegaproPlus Megasound aims to bring the very best karaoke experience to the Filipinos and with their line of new products. With the product lineup that they have, karaoke lovers will definitely be excited, especially with the introduction of the Wacky DVD Karaoke Player, one of the most affordable DVD players in the market to date, that can play as much as 18,000 songs to satisfy the concert kings and queens within every Filipino. Advancing the karaoke experience, MegaproPlus Megasound introduced Exodus Smart Player. Loaded with 1TB HDD, Exodus has a Mobile Karaoke App for effortless song search and remote function capabilities. Watch your score rise as you sing with its live-scoring system. Record your songs and save it on your mobile phone or connect to a Wi-Fi or Ethernet then share it online. Turn your television into Smart TV with its built-in apps (MiraCast, Youtube, Netflix, Chrome) for unlimited fun and entertainment that is beyond your imagination. Last but definitely not the least, the brand is also unveiling the MegaproPlus Digital Songbook App that is now compatible to most players, making it easier for karaoke fans to search for their favorite songs in a user-friendly interface. With the introduction of new products and innovations plus Piolo Pascual and Wacky Kiray as new ambassadors of Megapro Plus Megasound, a tandem that will surely carry MegaproPlus Megasound to connect to even more households, nurturing Filipinos' innate and natural love for karaoke. Sing to your favourite tunes with a brand that shares the same love that you have for karaoke.